In 1848, news of the Treaty of Guadalupe Hidalgo  the document that would conclude the two-year Mexican-American War  was leaked to John Nugent, a reporter with the New York Herald. After its publication, an infuriated Senate had Nugent called in for questioning; the Irish-born journalist refused to disclose his source, saying only that the informant in question was not a member of the Senate. That didn't seem to endear Nugent to any of his interrogators and he was kept under veritable house arrest in the Capitol building for a whole month. But Nugent didn't crack and the exasperated Senate released him, according to the institution's own official history, on "the face-saving grounds of protecting his health." He'd soon venture west and become editor of the San Francisco Herald. 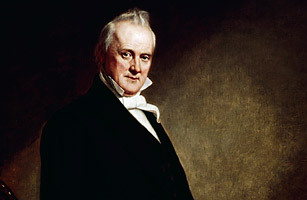 In 1858, Nugent was given a high-profile commission by then President James Buchanan to investigate developments in New Caledonia (now British Columbia). It was a fitting reward  evidence suggests it was Buchanan who, as Secretary of State, revealed the treaty's terms to Nugent.